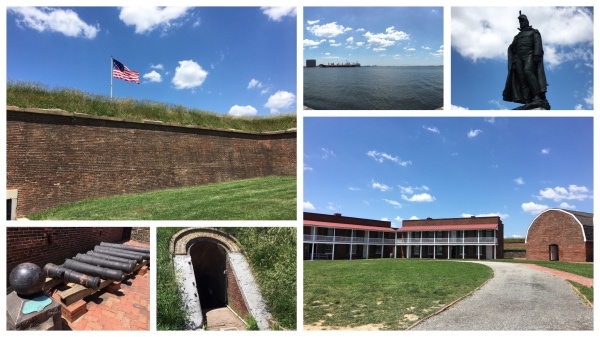 In early June, I had the pleasure of seeing Fort McHenry in Baltimore, Maryland. Although it was an active fort during the Revolutionary War, World War I, and World War II, it is best known as the place where our national anthem was penned after a valiant defense on the part of the Americans against the British in the War of 1812 — sometimes referred to as the Second Revolutionary War. The British had captured the state of Maine to the north and burned Washington D.C. to the south. Next they sought to capture the pivotal port city of Baltimore. They deployed foot soldiers to march in from the east, but they knew that any defeat of the city could only come about with the aid of a strong bombardment from their navy. And that could only happen if the navy could first take Fort McHenry, then travel up the inlet to where their weapons would be in range. In an effort to negotiate an exchange of prisoners, Francis Scott Key and John Stuart Skinner sailed out under a flag of truce to the British ships stationed in the bay. Because they had overheard details of the impending attack, they were forced to remain on board until the battle was over. So as the bombardment began, these two Americans watched from the vantage point of an enemy ship. As the sun set, they hailed Baltimore’s only hope, the fortress before them. As the light dimmed, the American flag fluttered in the wind and storm of that night, silhouetted by the setting sun. Because of the rain, the soldiers had hoisted the storm flag, which was 17 feet tall and 25 feet wide — smaller than the garrison flag and therefore less likely to break the flag pole as the fabric became heavy with rain and was whipped back and forth by the wind. Throughout the bombardment, Key and Skinner watched with both pride and trepidation, knowing that as long as the American flag continued to fly, the fort had not fallen to the British. Though it was the dead of night, the light from the rockets and bombs lit up the sky and confirmed, with each flash, that the American soldiers still held command of Fort McHenry. The bombardment stopped while it was still dark. Without the light from the rockets illuminating the sky, Key and Skinner had no idea whether the fort was still in American hands, or the British had succeeded in taking control. They longed to see which flag hung from the flag pole. They longed to know that the United States had rebuffed the attackers. But all they could do was wait and wonder. As the sun rose the next day, Key and Skinner could see, not the smaller storm flag that had flown the night before, but the larger garrison flag which, at 30 by 42 feet in size, caught the gleam of the morning’s first light and reflected the fact that the Fort had held. The British had lost. In exultation, Key began to write a poem on the back of a letter that he had stuffed in his pocket. He finished it after setting foot back on American soil. It was four stanzas long and was titled the “Defence of Fort M’Henry.” The poem was turned into a song when Key’s brother-in-law realized that it worked well set to a popular tune of the time. It wasn’t until 1931 that the song was officially declared to be the national anthem of the United States. top middle is of officer’s quarters, at right is the munitions, at bottom left is the building where munitions were stored. The flag can be seen over the ramparts. The statue in the upper right is of Major George Armistead who lead the soldiers during the attack. The barracks are shown at bottom right. The flag that was flown that morning is now on display at the National Museum of American History in Washington DC. 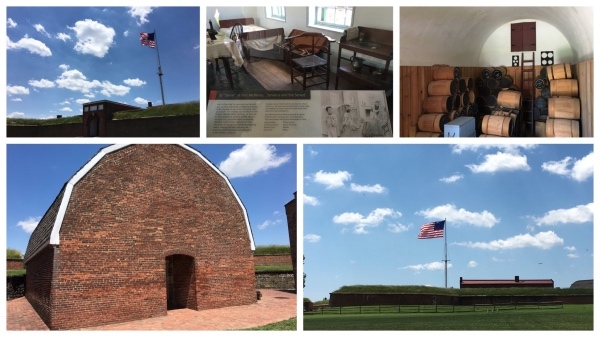 I learned a great deal about the writing of the Star-Spangled banner from our tour guide at Fort McHenry on June 6, 2016. I used a few Wikipedia articles to remind myself of some of those details — The Star-Spangled Banner, Fort McHenry, and the War of 1812. The painting of the battle at Fort McHenry at the beginning of this article was done by Kenneth Townsend and was on display at the Fort, which is now a National Park.